July 18 - We left Norfolk, VA early on Saturday morning after arranging for a shuttle from the hotel we stayed in on Friday night. We were flying free air fair via credit card purchases so you can imagine that we didn't get a 777 or an Airbus. 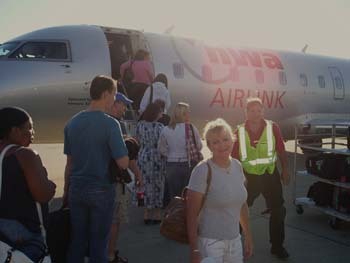 Yes, that is Deb walking to board a plane. You have to understand, even though I am a pilot and actually, not a bad one, she HATES to fly. We ultimately made it to Omaha, Nebraska on time and into the waiting arms of friends who, of course we will be imposing on for the next week. 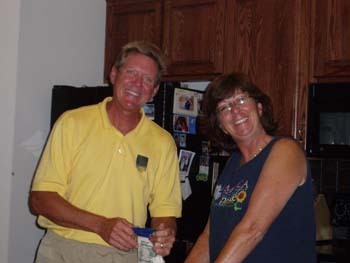 We arrived in Omaha and found Steve and Linda waiting to pick us up. What great friends! 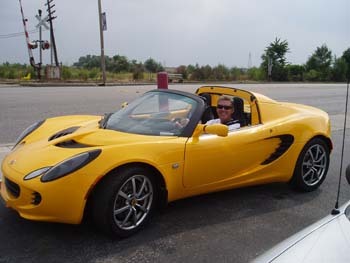 They took us to their new home, which I had seen under construction when I flew the airplane up in August of last year. I have to tell you, the place looks better finished but it looked exactly like it would in my mind when I saw it before. We had a great first night there and I was the first to call it a night and had to crawl off to bed since I had been up since EARLY that morning. Of course Deb, Steve and Linda stayed up a bit later catching up. Steve runs his own business. He own's Great Plains Aircraft an it is the number one Volkswagen conversion aircraft engine manufacturer and parts supplier in the country. I flew behind his engine for MANY years and wouldn't fly behind anyone else who is a wannabe be Volkswagen conversion dealer. I could go into too many details as to why but if you ever need a VW conversion, email me with you phone number and I will explain why you should go with Steve's engine. Of course the deal is that when I show up I also work because he has to work during the week to get all the parts and engines out. Unfortunately, I forgot too much to build engines so I get some other very important jobs such as assembling catalogs with Keith who drove in from Canada, before leaving for Oshkosh. By the way, Keith has been helping Steve out for years at Sun-n-Fun but this is the first time in many years he will go to Oshkosh. In addition, before Keith arrived, I also got to help wire the lighting in front of their house, help design the bearing surface for a new winch to be installed to lift engines for shipping, fix a three way switch with a dimmer that had a traveler reversed, cut down some chairs for the deck and a few more odd jobs. I've almost completed my first weeks projects. There is another list when I return and it will be fun too. 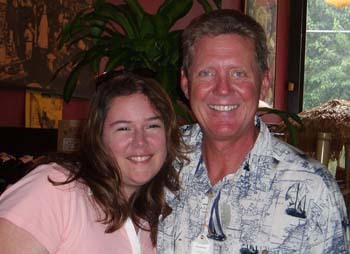 So here I was working away on Tuesday afternoon when I got a call from Gary and Shirlene. They told me they were looking at the article we wrote for Latitudes and Attitudes in the current edition. I was amazed because I was sure it wasn't going to be out for a few more months. 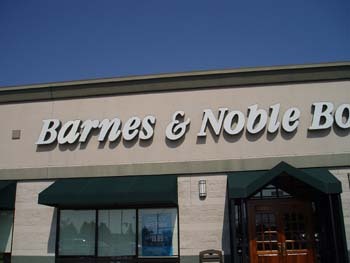 Of course I had to drive to Barnes and Noble Bookstores and pick up a copy. As you can see below, I purchased my copy and they guy at the counter thought I was having too much fun. Regardless, he still took my money. 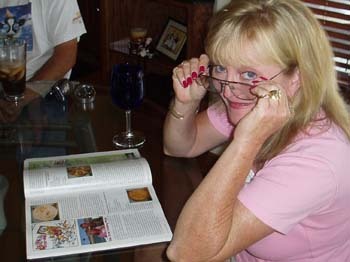 Below right you can see Deb as she is looking through the article. You might just be able to make out the picture that we took of ourselves in St. Augustine along with our bird Jimmy Buffett. 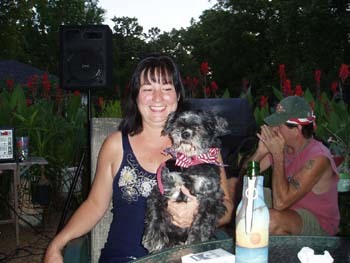 This is the same picture I am using on the main page of our website. Now you are going to think that I am just making this up, however, we had already planned on me cooking pizza tonight. So we had a great time celebrating the article and of course some wonderful pizza. We decided to cook 6 pizza's to start with. These ranged from the white pizza with chicken and alfredo sauce to a number of them with lots of different ingredients and red sauce which of course had more spices added. 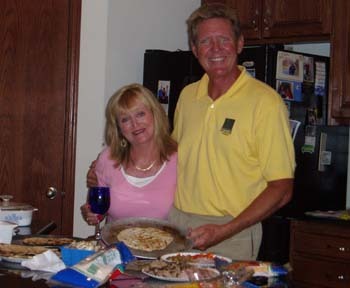 We had a wonderful evening and ate great pizza along with a little wine. 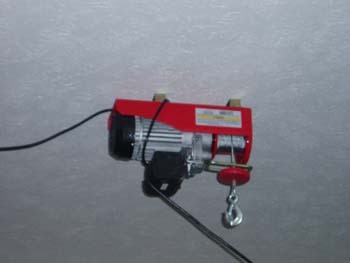 Remember that winch we installed this morning? Well, I'm not sure if it was the 2 glasses of wine or if it was just a great idea. 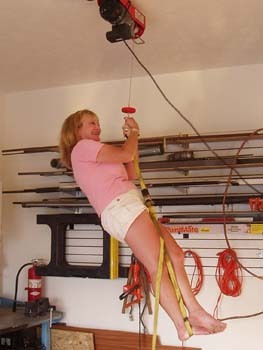 I said let's go ride the winch. So I got some volunteers and after they saw be go up, they decided it couldn't be that bad. 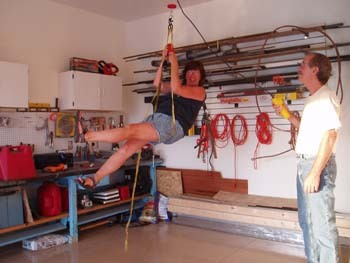 Actually we had a 2x6 spanning 4 2x6 joists so I knew since I was already up there on 2 installing this thing, it would hold me on 4 of them. 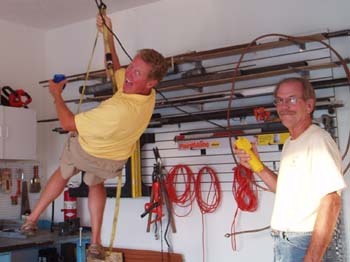 Perhaps Steve was really worried about the winch. Oh well, we showed him it would be ok to lift his engines now that we didn't break ourselves. 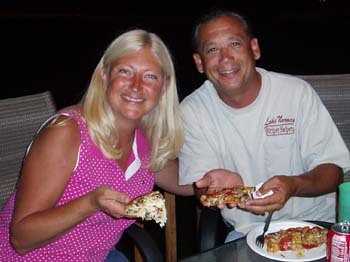 Later in the evening, Steve and Linda's neighbors, Lisa and Tony came over and I cooked them both a pizza. 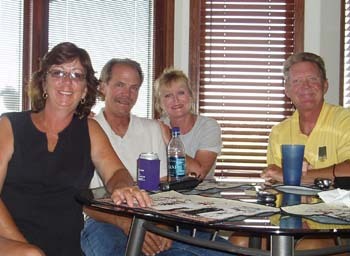 They had a great time and we sat up and talked and then I got out the guitar Lisa loaned us and played for a while. Overall, we had a great night. We ate pizza, rode a winch, and of course had great conversation on Steve's birthday. 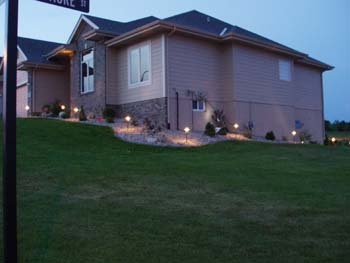 July 21 - Before we left Omaha, we had a number of other projects to help with. 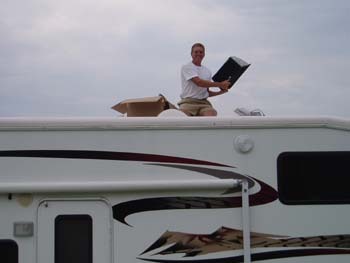 To the right you can see me starting to install the covers which go over the roof vents on the trailer. Keith and I were able to get them installed which meant you could leave the vents open and if it rained, the inside wouldn't get wet. 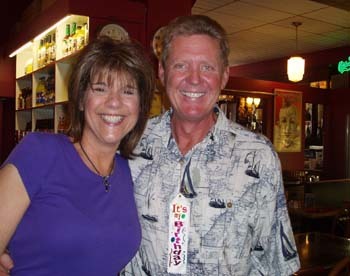 Marty and Ellen came in on Wednesday afternoon. Marty is a legend in the KR world and we had a great time flying before we both got rid of our KR's. Fortunately, for me, I will probably end up with mine back when we finish cruising. Anyway, on Thursday morning, it was time to take us all air boating. To the lower left you can see the airboat with Steve at the controls and Marty helping get ready. 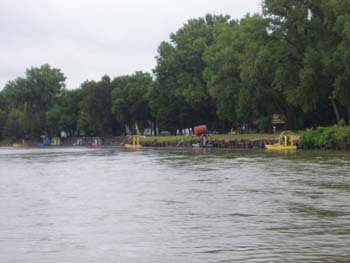 To the lower right, you can see Keith (lower), Marty (upper left), and Steve as we are starting down the Platt River. Just in case you didn't know it, the ear protection is required since the combination of the engine and propeller make quite a bit of noise. 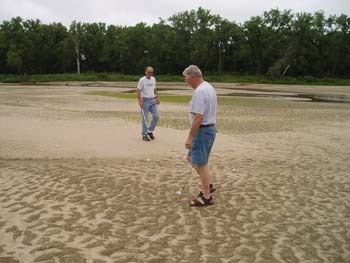 As Steve describes it, the Platt river is really a moving sandbar with water running through it which comes from the Colorado mountains. 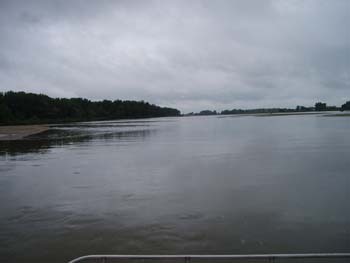 This is a wide and very shallow river. 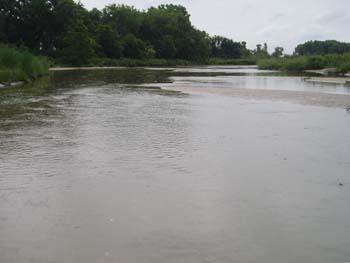 However, you can be walking along and just drop into a 4 foot section of water so it is also a dangerous river moving at 6 miles per hour. 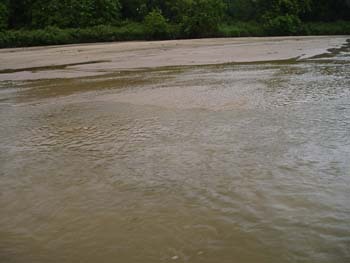 To the lower left, you can see the shallow water. 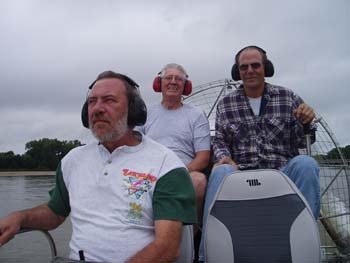 If you have never ridden an airboat, then you would think we might be walking here. However, this is where the airboat really does great. Once on "plane" you then are just skimming over the surface. If you head for these shallow spots, the boat goes faster and you can see areas you never thought were possible from a boat. However, you don't want to get stuck either. 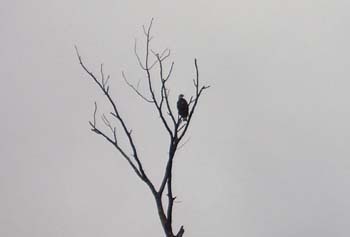 Below right you can see the eagle we saw as we were moving up the river. I didn't get a picture of the herd of deer. 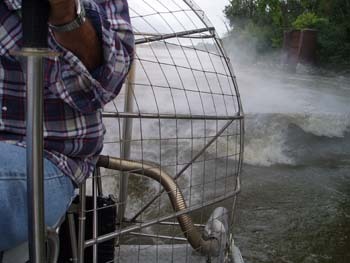 You might have noticed that big cage that surrounds the propeller on the airboat. 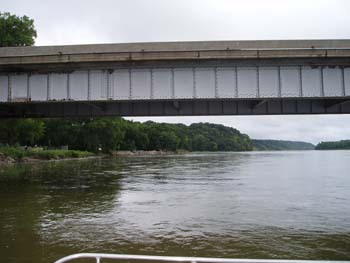 As you approach some of the bridges, you want to slow down so the boat sinks into the water more because it is a bad day when you hit a bridge with the cage which then would take out that propeller. To the lower left, you can see what happens to the water as you start speeding back up. The propeller blows water everywhere until you are up on plane. 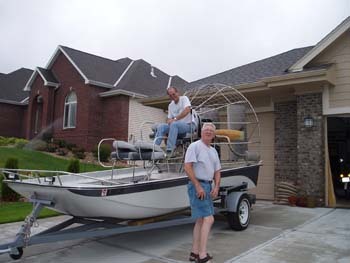 Since you aren't going to be running a typical boat with a lower unit and propeller in this river, then airboats are one of the options to see the river. Lower right you can see some of the other airboats in front of some cabins people use on the water. Of course the other option is to canoe down the river too. So what happens when you get tired of running the river? 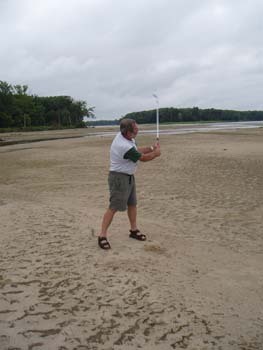 Time for a friendly game of sandbar golf. 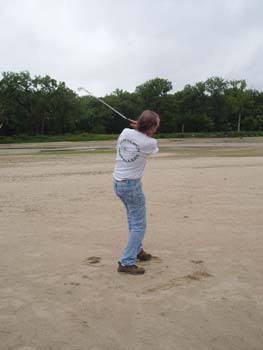 Of course nothing but the finest equipment - clubs were purchased at the local thrift store for one dollar a piece along with some balls. 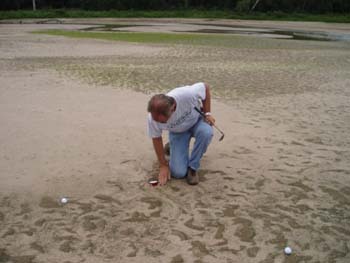 Next you need a golf course or should I say a sand course. Below left you can see Steve installing one of the holes. 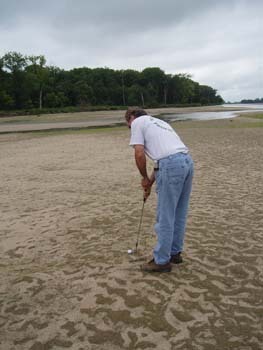 You might also notice that that the sand doesn't provide the greatest putting surface. However, it is the same for everyone so you toughen up and get on with the game. Further below you can see some action shots with Keith and Steve taking their swings. After the game, we headed back down the river for the trailer. After all, this was a work day for Steve and he still had parts to get out before they left for Oshkosh and we left for St. Louis. 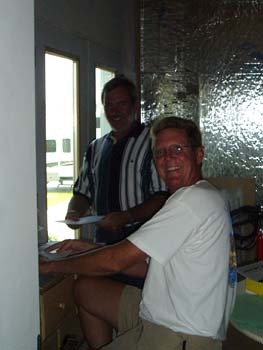 When we got back to their house, he rest of us guys took the airboat back to where it was stored, ran some errands and then we came back and finished making some more catalogs. 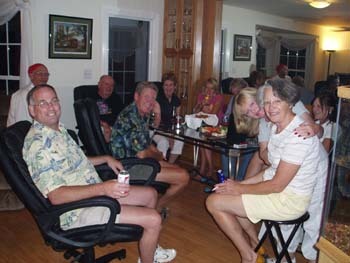 That evening, Linda had another birthday party for Steve and more friends came over. You can see the ladies below. The guys just don't photograph as well as the ladies do. Sorry guys. We were able to leave on Friday morning at 8 a.m. with the Beetle. 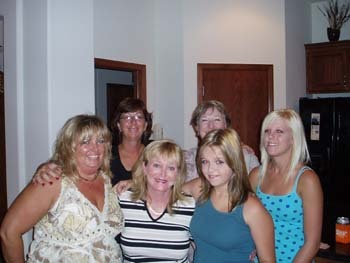 We drove to St. Louis and surprised my Aunt Sandy who didn't think we would come by until the next day. She decided it was time for Champaign and why not. After all, I hadn't seen her since she came to our bon-voyage party when we left in October. 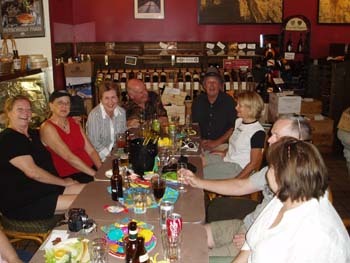 We had a nice, although short, visit and finalized plans to get together for lunch on Saturday. We then headed over to Mike and Gina's house where we will be imposing for the next week and a half. 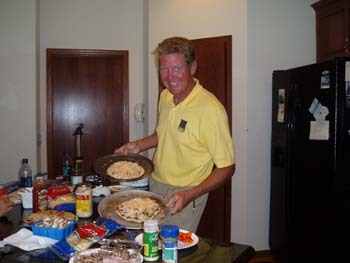 When we arrived, the old gang was already there and after lots of hugs and welcomes, MIke started cooking the fish he caught on a recent trip to the Keys. 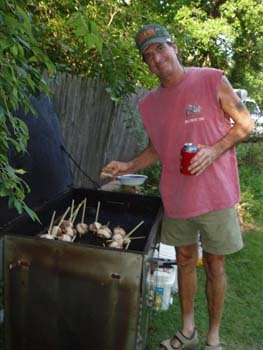 Mick was also cooking and his specialty is anything grilled. 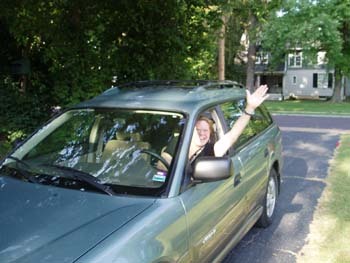 My cousin, Julie, arrived shortly after and we were able to meet her in the driveway. You might remember that she had come down to see us in January. It is always great to see her. 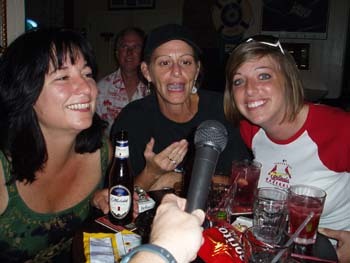 When we lived in St. Louis, I think we saw Julie about 2 or 3 times a week. Mike and I previously played together before I left St. Louis and tonight was the "reunion concert." I had stored a guitar, actually two of them, at Julies house so she brought over my Yari and within 30 minutes, we were playing again. I think it took about a half a song and we pretty much had the chemistry back. To the right, you can see Gina, and in the background Mick is playing the harmonica. Bottom left, you can see where Dave joined in too. 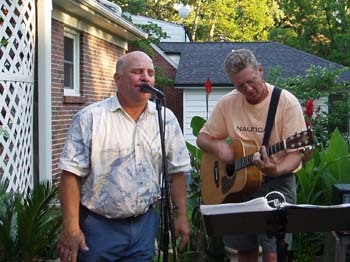 Dave plays lead guitar in a band which Mike sings for and I previously did their sound. Tonight he joined in on some of the songs with his bass. Mike and I kept on playing until my fingers got too tired. I Overall, I think we played about 3 hours and still had music left. It was time to get something to eat and join in with the rest of the party. 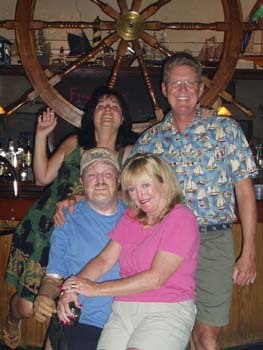 We stayed up too late but tried to catch up with everyone and tell a few cruising stories. We had a great time and I'm sure we will be playing everyday for the next week and a half. Mike is trying to find places for us to play and I think we have another party to play at and it also seems we may be going back to a restaurant that used to hire us to play later in the week. Life is too short not to enjoy your friends and family. I know we have great friends and family. 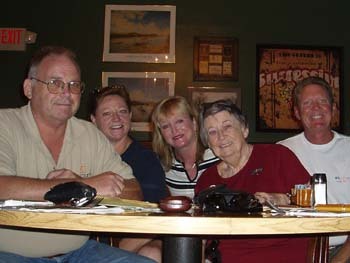 On Saturday, Deb and I took my cousin Tom, cousin Julie, (Deb) and my aunt Sandy out for lunch at one of her favorite places. 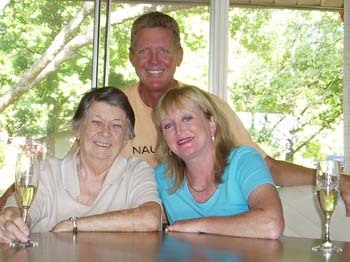 We had a great visit at her house before going out and it continued through the afternoon. It began as a great visit from the onset. 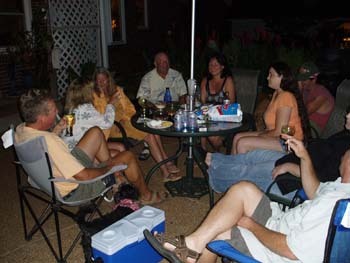 On Wednesday night, cousin Julie threw a party for us at her condo in the central west end of St. Louis. 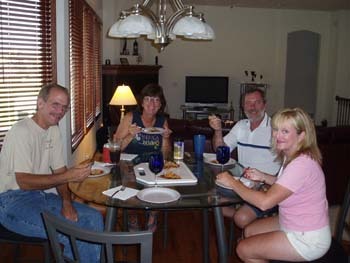 All of our friends dropped by and Julie had prepared quite a spread. 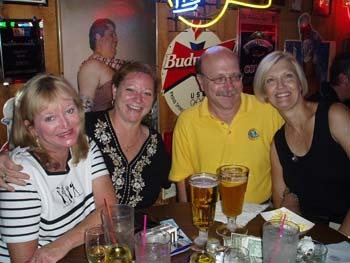 You might recognize Anna on the right as the person who came to visit us in Key West back in January. We were able to go out to the Dry Tortugas' with her and had a great time for the entire stay. I think we may have a few more visitors next winter either in the Bahamas' or the Keys. We had a great time catching up with everyone and truly appreciated everyone stopping by to say hi and give us their best wishes. It was also pretty cool that many of the people showed up in Pirate costume. I'm glad our boat is back in Norfolk or we would have to repel a boarding party swords and all. Last update, I mentioned that we were stopping by Colorado Bob's to see if he had wanted us to play. Well we walked in to the bar earlier in the week and there was Bob. He said, "are you guys playing again? Come down and play here anytime." Well, we didn't even have to ask. So we booked the Thursday night and invited a few friends to join us. To the right you can see a picture of the front of Colorado Bob's place. He calls it the Ship of Fools so you can already see why I like the place. Sailing models are around the bar and he is a great guy. 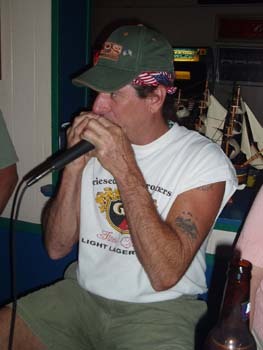 Previously Bob managed a number of bars in Key West before he came back to St. Louis and he loves boats. Bob has had some adversity in his life but with his great character and positive outlook, he overcame it and he is a great person to know. I hope I have as much character as he does when the time comes for me to face what life has to throw at me. When we play as a group, Mike and I are known as Last Flyte Out. 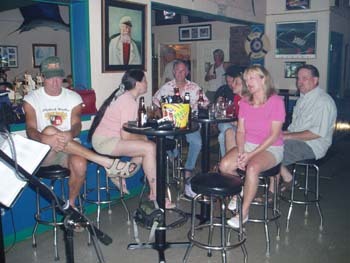 If you've ever been to Key West, you might have seen the shop Last Flight Out so you can see we "knocked off" the name. I talked to Clay (owner of the shop) about it down in Key West he he thought it was pretty cool. 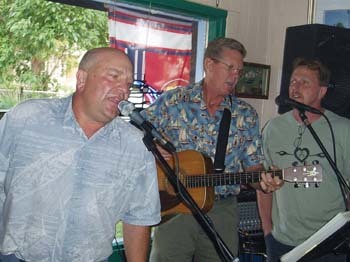 To the left you can see Mike and I and we were joined for a few songs by Mick playing the harmonica. Mike gives it all away and you can tell it from the sweet pouring out. Of course I was the lucky guy standing over the A/C vent. I'll be he makes me move next time! 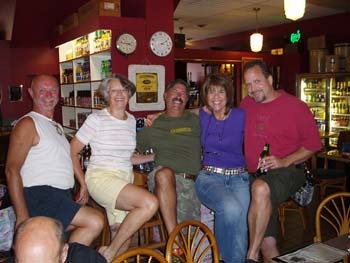 Lower left we had a good group of people we had invited and at the bar were the regulars who had stopped by for happy hour. Lower right, you can also see Dave dropped by to join us in some songs too. 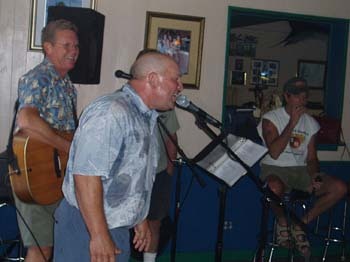 On the left, Julie caught Mick in his performance of a couple of leads for Runaway. He has that harmonica part "ripped." And we even had some of the audience singing along. Meet Colorado Bob. Bob had snuck out towards the end of our gig so someone called him and had him come back so we could get some pictures for the website. After all, it is my goal that EVERYONE we meet is on the website. After all, everyone has a story. 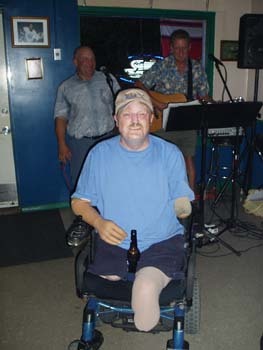 He drove back and since we had finished playing, we decided that we just had to play a few more songs. We started with his favorite which is Harvest Moon. 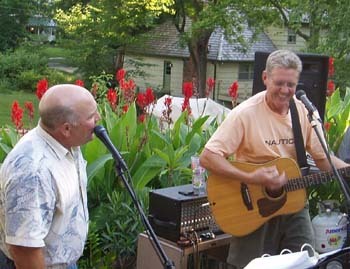 After that, Mike and I shared the singing load for a half hour before really calling it quits and joining in the party. 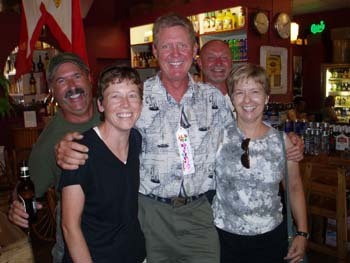 Deb, Gina and I had our picture taken with Bob and I know he just "hated" to have to do it......... We all had a great time and from the sound of it, the regular patrons enjoyed it too. 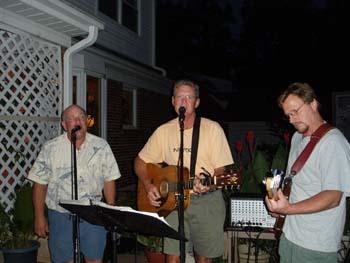 It ended up that Bob had an opening on Saturday August 4th so we are now booked to play again between 8 and 11 p.m. Once again, this should be a great time so, if you are in St. Louis that weekend, stop by and see us. 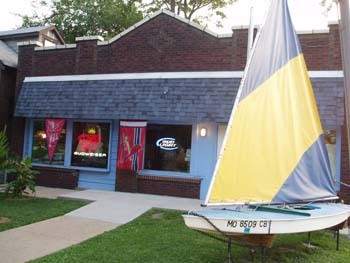 Colorado Bob's Ship of Fools is located at 3457 Morganford Road, St. Louis, MO 63116. July 31 - Saturday morning, we headed over to Julie's house so we could then go on to an afternoon gathering. 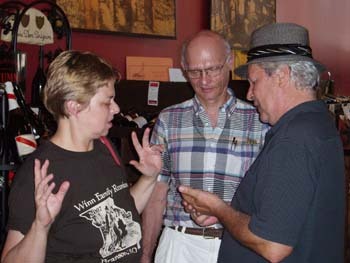 It was an opportunity for some of our friends, that we hadn't seen, to stop by. We didn't really know what to expect except that we knew we would see a number of people. We were overwhelmed with the number of people who came by just to hear a few stories and catch up. 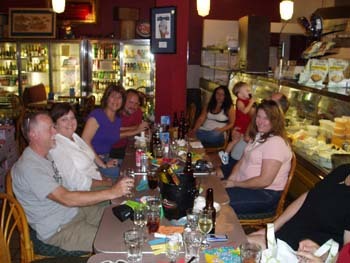 We had people from my previous place of employment, our townhouse association, and more friends we knew from the Central West End in St. Louis. We were scheduled to be at the restaurant called Koperman's between 1 and 4 p.m. but ended up staying until 5. It was a great time as you can see from some of the pictures below. I have truly enjoyed coming back to see everyone and appreciated each one of you who stopped. Even though many of of our friends still can't understand why anyone would go cruising, they can see that we are totally happy and having the time of our lives. I just hope everyone is as happy and are able to achieve their dreams too. It just happened that my birthday was the following week so Rose just had to get this birthday picture. A tradition with her by the way. 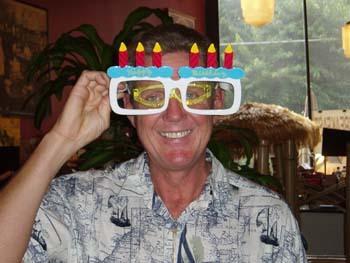 I think this was my first picture with the glasses and candles. Typically there is a hat involved which is meant to be fun but for many will totally embarrass you in public. Regardless, everyone gets a great laugh. Thanks again to everyone who stopped by. Again, I was humbled by the showing of affection and wish we had more time to catch up with you. Having one party wasn't enough however. We left Koperman's and then went on to Forest Park and the Boathouse where we heard the Apollo's. This is a band that I was able to record before I left St. Louis. I always wished we would have been able to do the recording properly but they were able to get a demo CD out of it anyway. They are a great band and have nine different members. For those who know something about music, having nine different members is a lot like herding cats at times but it sure works for them. We had a great time listening to the music and again seeing more friends at the Boathouse. 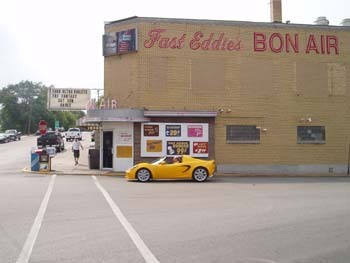 We slept in on Sunday, I'll bet you can't imagine why, and then we were off to Fast Eddies in Alton, IL. 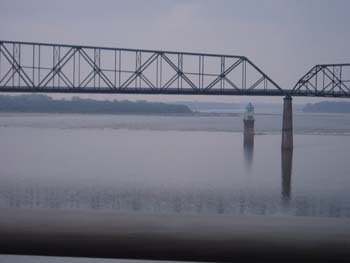 We crossed the chain of rocks bridge, below, and you can see the ripples in the water from the rocks. Just think, Lewis and Clark had to pass over the same rocks. 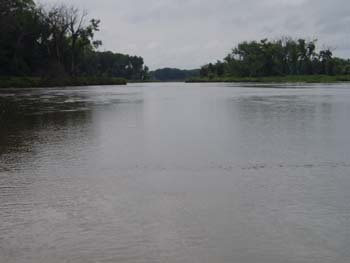 Then to the right we stopped at the location where Lewis and Clark spent a winter before proceeding up the Missouri River. 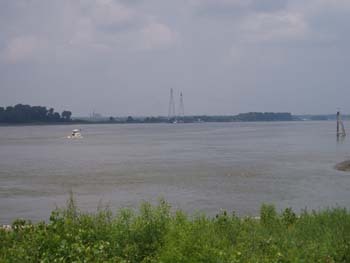 To the lower right, you can see where the Missouri and Mississippi join for their trip to New Orleans. Fast Eddies is almost a historic landmark. You can get some of the best and least expensive food in St. Louis here. 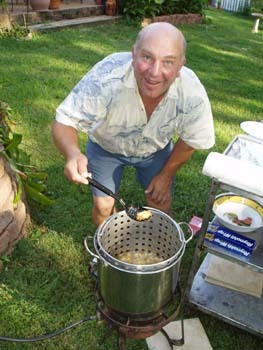 The grill is going continuously. To keep prices down, they have a limited but excellent menu. 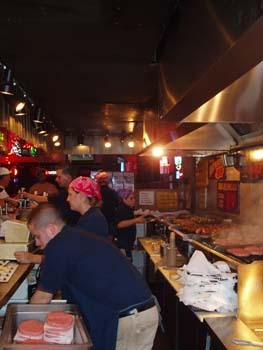 Shrimp - 29 cents each, steak on a stick for 1.99, half pound burger for 99 cents, and the list goes on. They serve more shrimp here than any place in the St Louis region. We were listening to the band when in walked our friend and dentist. We had just seen him earlier in the week professionally and were talking about how he hadn't seen to my cousin in a while. In they walked and of course he hadn't been to Fast Eddies in something like 20 years. It seems some things always work out for the best. 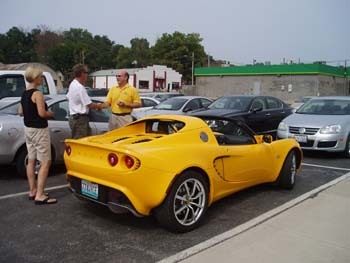 As they were leaving I was able to try on his Lotus which was great fun even though it was just in the parking lot. We had a great visit and they were off for St. Louis and we soon followed. After all, the day was still young and there was another place to go. Truly, I think I have to get back to the boat to sleep for a week. Everyone is trying to feed and drink us to death. We are having a great time. 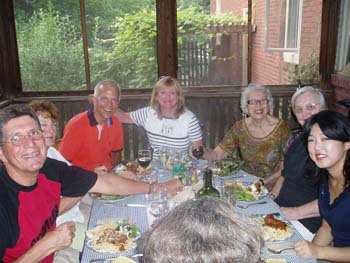 It is a tradition at Anna's house to have a dinner every Sunday evening. 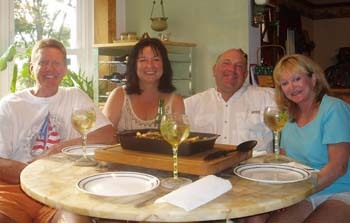 We were the surprise guests and we hadn't seen a number of the dinner guests in a year. In addition, there are always additional people at the house. Anna works with an international agency and typically has someone staying with her so they can work in the country for a short period of time and practice speaking english in America. 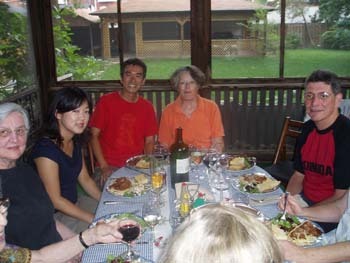 Tonight we had two people from Japan and an old friend of Anna's from Austrailia. Every dinner seems to be a wonderful experience. 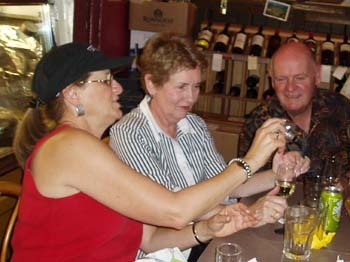 Couple the international flavor with with the "regulars" and you have conversations that will entertain and challenge. Once again, we had a great time, great food and it was great to see everyone again. Monday night I cooked a fish casserole and we called it an early night. Mike and Gina have been wonderful hosts and we have just about imposed enough on them. We will be leaving on Wednesday morning for another house of friends down in southeast Missouri. We can't thank Mike and Gina enough for allowing us to stay for the week and a half. 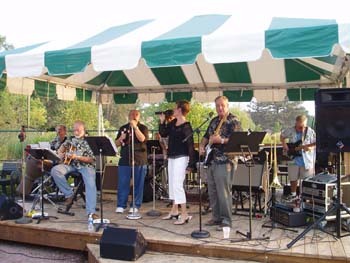 However, we will see them again on Friday night for a short "band" practice since Mike and I will be playing on Saturday August 4th. We hope to see everyone at Colorado Bob's.